Have a question on A3 Sedan 2019? Watch latest video reviews of Audi A3 Sedan 2019 to know about its interiors, exteriors, performance, mileage and more. Audi A3 is a compact-size executive sedan manufactured by the German automaker Audi which however was introduced as a hatchback since its inception in 1996 and over the years has made its presence in the compact sedan segment globally. Decent cabin space, efficient engines and practicality defines all of the aspects of this stylish car. A3 saloon, has been introduced with powerful TFSI engines that results higher power with lower fuel consumption. It is made available with two petrol engine variants such as 1.4 litre TFSI and 1.8 litre TFSI quattro. The 1.4 litre TFSI engine produces 125 hp at 5000-6000 rpm with the peak torque of about 200 Nm in between 1400 to 4000 rpm. Whereas, the 1.8 litre quattro engine generates the highest power of 180 hp at 5100-6200 revolutions and 280 Nm of highest torque in between 1350 to 4500 rpm. Alongside, it employs with S tronic transmission (7 speed for 1.8 TFSI quattro and 6 speed for 1.4 TFSI) which expedites shorter gearshift times and Audi drive select efficiency mode (Offers Auto/ Comfort/ Dynamic/ Efficiency/ Individual modes) to improves its fuel economy. Made available in three equipment lines to choose from, one can opt any of the lines amongst Attraction, Ambition and Ambiente and customize your own Audi A3. The German manufacturer has facilitated this four-door sedan with number of advance equipment embracing hi tech technologies, including MMI® radio integrated with MMI control concept which comprises electrically extending 5.8 color display screen and MMI control panel, deluxe automatic air conditioning, electrically adjustable seats, interior mirrors with automatic anti-glare action, rear lights with LED technology, fog lights, rain sensors, electrically adjustable exterior mirrors, single CD player and SDHC memory card reader with MP3, AAC and WMA compatible and Driver Information System. A3 is loaded with number of safety aspects such as airbag system, Traction Control (ASR), Electronic Differential Lock (EDL), Anti-lock Braking System (ABS), Electronic Brake force Distribution (EBD) and Brake Assist, as the brand never compromise with the safety of its occupants. Audi A3 is expected to hold its value in terms of mileage and fuel economy, although it offers Audi drive select efficiency mode which actively supports the driver with a driving style that reduces its fuel consumption. It is equipped with efficient TFSI engines which results decent mileage and fuel economy. The 1.4 Litre TFSI engines gives the fair mileage of 4.9 litre/100 km, along with CO2 emission as low as 114 g/km, while the 1.8 litre TFSI quattro engine takes the fuel consumption of 6.5 litre/100 km with 149 g/km CO2 emission. Moreover, A3 has the capacity of increasing the generating voltage and converting it to kinetic energy (into electrical energy) at the event of coasting and braking, as it is supported with recuperation. New Audi A3, is fitted with inventive TFSI engines that comprises impressive efficiency with enhanced performance. Variants equipped with a turbocharge motor, 1.8-litre TFSI quattro engine produces the maximum power output of about 180 hp in between 5100 to 6200 rpm , and the peak torque is 280 Nm in 1350-4500 revolutions. Whereas, in 1.4 litre TFSI engine is capable of generating 125 hp at 5000-6000 rpm, along with 200 Nm of highest torque in between 1400 to 4000 rpm. Audi A3 Sedan is as fast and perceptive as most drivers expect from a luxury car that doesn’t create a sumptuous gesture of a sedan. Being a dedicated sedan in its class, the TFSI engine of Audi A3 delivers prevailing acceleration specification. The 1.4 litre TFSI engine reaches the 0-100 kmph mark from a halt in 9.3 seconds attaining a top speed of about 212 km/h. Further, these figures are improved in case of the much powerful 1.8-litre TFSI quattro engine which takes 6.3 seconds to achieve the same check point, and reaches a top speed measuring 235 km/h. 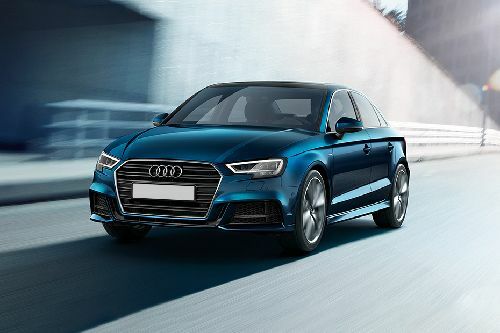 The new Audi A3, obtains it sleek and stylish appearance with its dynamic contours, coupe-like lightness and classy exterior segments which perfectly matches with the brand “Audi”. Comprising a wide, low and compact structure, this Sedan is ready to discover the world of abundance. It is perfectly integrated in the three dimensional body line comprises air intakes and an exciting spoiler that creates a gaze of sportiness. Also, the low, streaming roof lines easily conveys the dynamism of its exterior. The enthralling trailing edge and flawlessly rising rear lights with LED technology shares its progressive sportiness. Further, it has Xenon plus headlights with LED daytime running lights for better vision, front and rear fog lights, rain sensors, electrically adjustable exterior mirrors, automatic headlight range adjustment and headlight washers. This four-door Sedan comprises specific exterior dimensions that exhibits its exceptional structure. The length of this luxury car comes at 4456 mm and the overall width is about 1796 mm. The height of Audi A3 stands at 1416 mm. The latest Audi A3 is a perfect combination of comfort, dynamism and stylishly designed Sedan. You can feel the exhilaration of the high quality interior when you sit into this luxurious car. With elegant electrically adjustable seats (For driver seat) which are optionally available in Milano leather, this car creates a business like environment for its occupants. On board, the Audi A3 has deluxe automatic air conditioning system that regulates the temperature automatically, MMI® radio integrated with MMI control concept which comprises electrically extending 5.8 inch color display screen and MMI control panel and a multi function leather covered steering wheel with 4-spoke design. The interior of A3 is designed with absolutely sublime quality which is among the best in its class. In addition, this car has impressive interior mirrors with automatic anti-glare action, sun visors with illuminated vanity mirrors (For driver and front passenger) and 3D design inlays. The interior has been impeccably tidied up and reduced the user interfaces. Audi A3 proposes comfort in the appointed seating positions to its occupants. It is equipped with electrically adjustable seat for the drive, to make driving comfortable having the wider view of the road, along with manual adjustment for front passenger seat. For convenient opening and closing function, this luxury car feature easy windows and a separate luggage compartment to store your extra luggage. Also, the side and rear windows of A3 is employed with heat insulating glass that results suitable temperature inside. Providing additional advanced aspects like cruise control, Electromechanical Parking Brake, start or stop system, shift paddles behind the steering wheel and Audi drive select are some of the add-ons for this extravagant car. The quattro all wheel drive variant of Audi A3 offers the maximum boot volume of 425 litres. While, choosing four wheel drive, the chassis variation reduces to 390 litres, which is not an impressive aspect for a luxury Sedan. The boot space can be further extended with folding rear seats. The Audi A3 Sedan employs TFSI engines that combines the assets of FSI technology, with turbocharger which ensures decent power delivery. These TFSI engines including 1.4-litre and 1.8-litre quattro contributes reducing fuel consumption and enhances the performance of the vehicle. The 1.4 litre TFSI engine have the capacity of generating 125 hp @5000-6000 rpm, along with the peak torque of about 200 Nm in between 1400 to 4000 rpm, whereas for 1.8 litre quattro engine produces 180 hp@5100-6200 revolutions and the maximum torque generated is about 280 Nm at 1350-4500 rpm. Alongside the A3 is facilitated with 6-speed and 7-speed S tronic transmission which expedites shorter gear-shifting with no distinct interruption in the power flow. The luxurious Audi A3 Sedan is provided with advance MMI® radio integrated with MMI control concept which comprises electrically extending 5.8 inch color display screen and MMI control panel. This radio is equipped with a single CD player and SDHC memory card reader with MP3, AAC and WMA compatible, 10 loudspeakers with total output of 180 watts, along with an auxiliary input to add some excitement to your ride. You can talk over the phone while driving, with appointed hands-free operation. Also, the Audi A3 embraces a Driver Information System for giving each and every information such as fuel range, average fuel consumption, average speed, average driving time and service interval display. The new Audi A3 Sedan, comprises large and tough wheels which gives the glimpse of its robustness and sportiness. This luxury car is employed with 17 inch cast aluminium alloy wheels, embracing the tyre size of 225/45 R17. Additionally, 18 inch tyres are available as an option. The latest Audi A3 stands at the leading end of the cutting-edge technology segment, as it offers amazing handling and dynamic suspension that supports the driver at all times. This luxury sedan is provided with disc brakes for both front and rear, secondary collision brake assist which reduces the severity of a collision and Electromechanical parking brake that encloses starting-off aid and emergency braking functions. In addition, the Audi A3 offers Electronic Stabilization Program (ESP) comprising Traction Control (ASR) for preventing loss of traction, Electronic Differential Lock (EDL), Anti-lock Braking System (ABS) averting the wheels from locking, Electronic Brake Force Distribution (EBD) which varies the amount of applied force on the vehicle’s brakes and Brake Assist. Being a Sedan designed by Audi, A3 is bestowed with high quality safety aspects to make you feel safe during the ride. For safe and secure ride, high performance air bag system is appointed in this luxury car. The airbag system encloses two airbags for driver and front passenger with front passenger’s air bag deactivation, 2+2 head and side airbag, and knee airbag system. Besides that, for superior handling, it is employed with Electronic Stabilization Program (ESP) including Traction Control (ASR), Electronic Differential Lock (EDL), Anti-lock Braking System (ABS) that prevents the wheel from locking, Electronic Brake force Distribution (EBD) varying the amount of applied force on each brake and Brake Assist. At the event of collision, the Secondary Collision Brake Assist reduces the severity of an accident. In addition, it is equipped with electronic vehicle immobilization device and ISOFIX child seat mounting for both front and rear seat passenger. What are the Safety Features Available in Audi A3 Sedan 2019?